Home › Miscellaneous › Open water swimming: how do you handle “The Fear”? You know, I just accept it. Like the pain you feel at the end of a triathlon….I know it’s coming, I can’t prevent it, but how I RESPOND to it is what will determine the ultimate outcome. So when the fear comes, normally when the blue water turns deep and black….I say, “hello old friend, how have you been….” and I chat with fear for a while as I continue swimming. I ask it things like, “what’s new here?” because NOTHING is new and why should I be afraid, and I’ll say “gee, you haven’t been around in a while” because I haven’t been fearful of much lately…. then I’m usually either bored, no longer anxious, focusing on my stroke again, or back in the blue water…. I just find fear, like pain/discomfort is something that is always going to be there and better to treat it like a friend than an enemy. Thanks for your comment and great advice! I think it all comes down to mental toughness. Like you said, thinking of the fear as a friend and convincing yourself that everything is normal helps avoid unnecessary anxiety. I start off every race with bobbing. It’s rather timely that I received a link to this article from two entirely unrelated sources yesterday. The same day I had decided I needed to get over my fear of swimming (again) and get back in the water. I joined my local tri club and did their shortest enticer race last night. 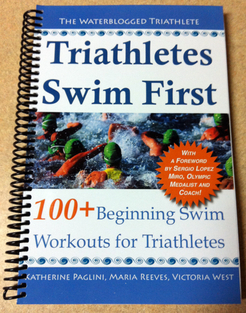 I hadn’t been in the water since April – studiously skipping every single swim session on my training plan. It’s comforting to know you’re not the only person with irrational fears – especially when you KNOW they’re irrational. I haven’t found a way to conquer it yet but am certainly interested to read some of the techniques that work for others. Just finished my fist open water ocean swim and loved it. I decided to hop in the ocean and swim a bit the day before. This is almost a ritual at this point as it makes me feel more comfortable in the water I will be swimming in. In this case it got me familiar with the feel of the currents and the tides. Then on race day, if possible I do the same thing before my heat goes off. I get in the water and I start to drift my mind and steady my breathing. Once I feel calm and my bladder is empty I start to visualize my race through the swim course into transition, the bike and eventually the run. After five triathlons this works every time. You have a good point! I always thought people got into the water before the race to warm up and get used to the water temp, but it also definitely helps you get familiar with your surroundings. It is funny, after Katie posted this, we waterbloggers ended up sharing our open water fears with one another. It seems we’re all most afraid of brain eating amoebas and bacteria in the water. Totally normal things to be afraid of, right?